SIM SMITH is pleased to announce a new performance event and installation by British artist Jonathan McCree and choreographers from New Movement Collective. The installation features live dance performance, painting, film and music. SIM SMITH is pleased to announce a new performance event and installation by British artist Jonathan McCree and choreographers from New Movement Collective. The installation, featuring live dance performance, painting, film and music will be on view from 7 to 30 October at Arch 147, opposite Newport Street Gallery. The installation is inspired by its location and local history. On the southern bank of the Thames to the east of Vauxhall Bridge, from the early 18th century until the middle of the 19th century, could be found the Vauxhall Pleasure Gardens. There were avenues of trees, ornamental gardens and pavilions of culture. During the daytime it was a respectable place, a place for a family day out perhaps. Yet after dark it took on a more uneasy air. The technology, design, music and art were pioneering and the famous artificial illuminations would have created an atmosphere of dramatic escapism, a sensory dreamlike world. It is hard to imagine today the impact the experience would have had. It was a raucous place, but also a public art gallery and concert venue with paintings by Hogarth and music by Handel amongst others. An imagined day at the Vauxhall Pleasure Gardens is the springboard for the installation and performance that will trace the day's duration. The narrative moves from morning to night, light to dark, order to chaos, polite to dangerous, cultured to illicit. 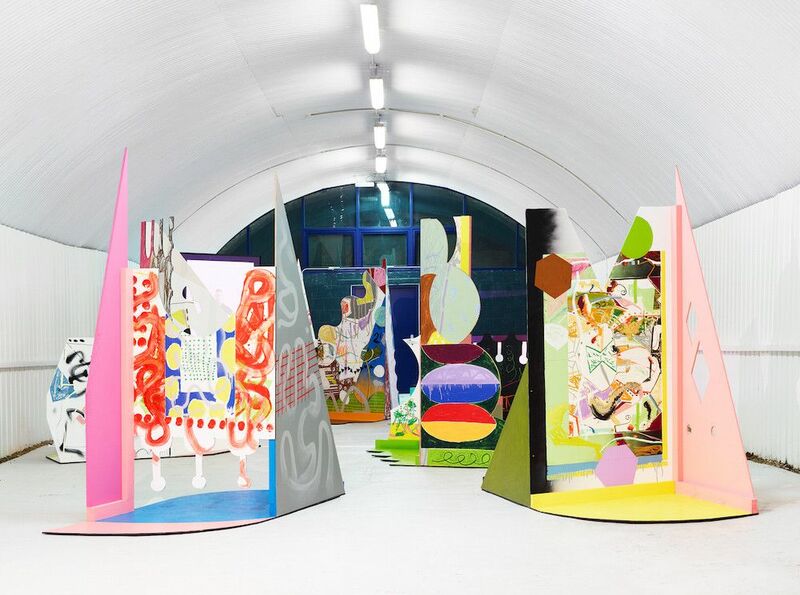 McCree is attracted to what he imagines the visual language of the Vauxhall Pleasure Gardens to have been; the structures, the ornamentation and the playfulness as well as how notions of 'high culture' sat within the general audience experience of the Gardens. The artist-made architectural structures or 3D paintings, will create simple spaces within a space, a fictive place brought to life by performance, film and its audience. Dance will be the structure’s animating breath, performed to a musical composition by Paul Statham. This work continues McCree’s exploration of themes; using an array of borrowed visual references alongside an abstract vocabulary that wildly interweaves through abstraction and expressionism. His marks are his working out and understanding of what he sees, his response to and relationship with the everyday, the strange and the unfamiliar. With strong architectural features and distinguishable structural designs, these architectural structures push his work into demanding a physical and intuitive encounter. He plays with repetition, mutating gestures and expressions, setting up visual propositions for himself and the viewer. Negotiating uncertainty sits at the centre of McCree’s practice and neither viewer, nor artist can be sure of what the outcome will be or where they will end up. The installation goes beyond the associations traditionally related to experiencing a painting, and instead generates actions and activities, which explore ideas, dynamic relationships and situations. The piece aims to explore the artist’s notion that “anything can be a painting”, through a merging of artistic genres in a site-specific environment that challenges preconceived notions of the role of the viewer from the moment they enter the space. “I like to think of a painting as a space in which anything can happen. My practice seeks to define what this space is and what might go into it. For me, anything can be a painting; marks on a sheet of paper or canvas, a dance, a film, a crowd. I think of my paintings as fictive spaces where narratives interweave and overlap. I like to play with and stretch a space and what goes into it.